Jean Grey proclaiming to the world. 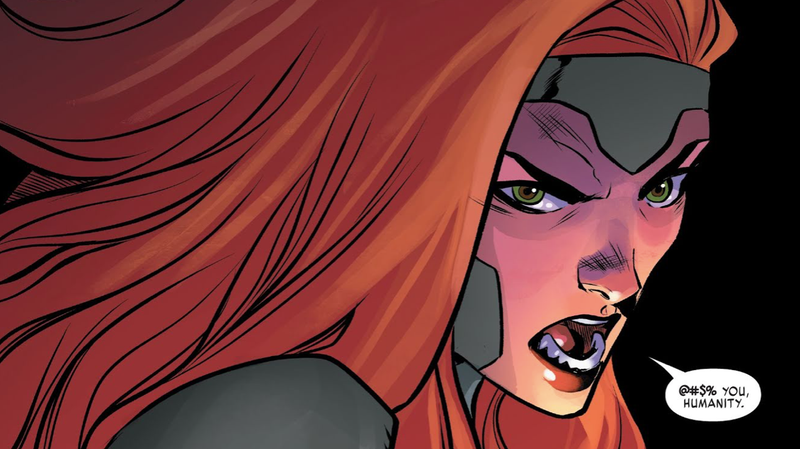 As tends to be the case with X-Men comics involving Jean Grey, X-Men: Red has been somewhat dense (in a good way) that makes catching all the way up to this week’s issue #10 something of a chore. But the major beats you really need to know in order to contextualize one of this issue’s narrative devices boil down to three things. And they are: 1) Anti-mutant racism fueled by factually incorrect stories is on the rise on social media, leading to anti-mutant sentiment taking root in people’s minds; 2) at one point, a new breed of microscopic Sentinels was developed that could “infect” baseline human beings and cause them to suddenly turn into expert killers hellbent on murdering mutants in their vicinity; and 3) all of the mayhem Jean’s team has been facing up until this point was all orchestrated by Charles Xavier’s parasitic, psychic twin Cassandra Nova. While Jean is locked in a psychic battle with Cassandra Nova to free Rachel Grey from her control, the rest of the X-Men are busy spending their time on the internet in search of demonstrably-false stories demonizing mutants. Trinary, the team’s technopath, reasons that she can easily enough fix a large number of the articles in hopes of staving off the influence they can have to drive people to actually lash out at minorities. Within the context of the comic, the link between those things is direct and explicit, but it’s interesting to compare it as a plot device to the controversial study linking people’s engagement with hate groups on social media to upticks in real world violence. Trinary and Honey Badger scouring the web for anti-mutant sentiment. With some classic, X-Men psychic trickery, Jean is able to free Rachel from Cassandra’s grasp and regather her troops before striking her final attack. At first, it doesn’t seem as if Cassandra would have any substantive way to get back at Jean in a way that would hurt. But rather than trying to fight using her telepathy to get into people’s minds, Cassandra instead decides to use methods much more human in design. If you’re reading io9, then you probably know what deepfakes are. For those who don’t, they’re videos—often of people’s faces—that have been manipulated to make it seem as if people are saying things they are not. Deepfakes have always been creepy, but now they’re getting good to the point that some lawmakers fear they could pose significant threats to society. Instead of just using racism and hatred at large to disrupt the world, this time Cassandra gives humanity the kind of singular target it can easily aim itself. Using a sophisticated deepfake of Jean, Cassandra announces to the world that “Jean” is prepared to bring about the end of the human race (no Phoenix required). Trinary and Storm discussing the fallout of Cassandra’s attack. Of course, Cassandra’s threats are nothing Jean and her X-Men can’t ultimately take down. But while discussing the impact of Cassandra’s use of Jean’s likeness to push her agenda and feed into the rising tide of online hate, Storm points out something important. No matter what they’re able to prove about what actually happened, there’s a contingent of society that will cling to whatever it wants to believe about mutants. As small as an evil that might seem compared to some of the other foes the X-Men have fought over the years, it gets at the heart of the X-Men franchise being built on stories about persecuted people trying to save a world that hates them.